Bonio and Etem testing Quick just now. Quick up to the task. Deejay at Honda Center busts out Tomorrow Never Knows, the psychedelic Beatles tune. That's a first for me here. 27 have played for #NHLDucks & #LAKings , 7 in 100 games or more for both: Bylsma, Corkum, O’Donnell, Penner, Rychel, Sandstrom, Visnovsky. Selanne draws interference penalty on Voynov with 4.7 seconds left in first period. End of first period of first game of first playoff game between Kings and Ducks: 1-1. Shots were 7-5 in Ducks' favor. Kings dominate first half of period, then spend as much time defending their goal since the first part of SJ series. Tied, 1-1. End one: 1-1 @AnaheimDucks and @LAKings . Voynov interference will have Ducks on PP for first 1:55 of second. 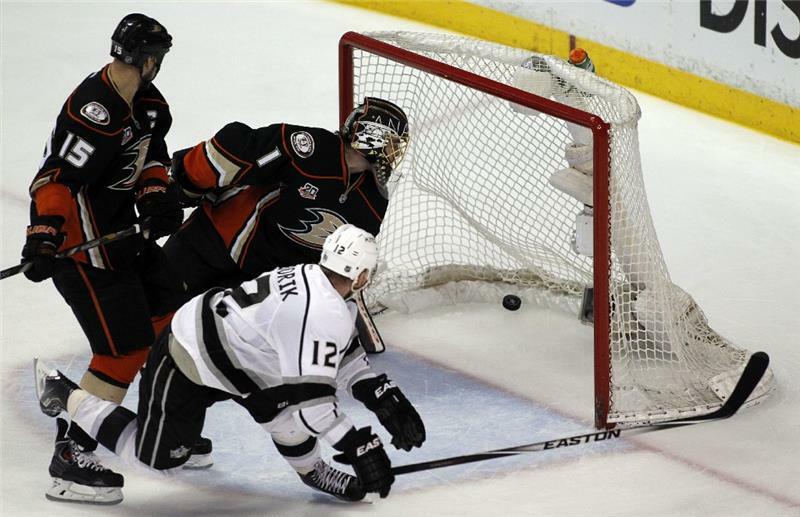 Ducks credited with 22 hits, to 15 for the Kings....Drew Doughty played 8:14. Want to listen to the #LAKings radio broadcasters? Well you can! lakings.com/app or on AM 1150. This is what it looked like. And boom the Kings win. #NHLDucks Boudreau on Game 1: "It's a 3-2 overtime game where both teams battle and no one dominated. Either team could have won."